It’s wonderful heading into autumn, because it brings up a whole new interesting set of flavour possibilities. My last post was about blackberries, and yesterday I had occasion to wander around my back garden for the first time in ages. 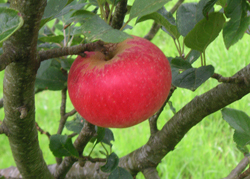 There, on the little apple trees planted by my landlady, were the most beautiful and tasty apples. Peel and core the apple, and blend together with the lemon juice and coulis as soon as you have strained the latter (it’s more liquid when hot, which will make things easier). Refrigerate until cool. Fold in the custard and blackberry-apple coulis. Notes: 1. You can add a bit of cinnamon or vanilla if it’s to your taste. Its my daughters 5th birthday in December and I’ve had an eye out to source a great flavour for a good old fashioned baked alaska birthday cake. Could this be the flavour I’m after? 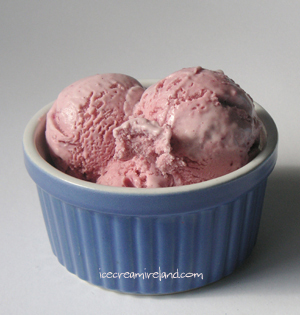 Also wondered, have you tried making any dairy free ice creams? Very nice blog!. This recipe is very intriguing. 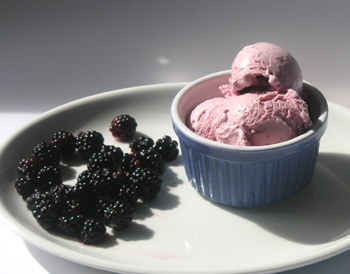 I love berries and the apple addition is a real twist. I have to ask: is the apple flavor discernible? It looked promising (blackberries are a favorite of mine), but I think in the end, the taste of egg is too strong. I don’t grow apples, so what variety would you suggest I buy? Thanks!